This sign making hack will change the way you DIY wood signs forever! Here’s how to prevent stencil bleeding when making wood signs, which is such an annoying problem. If you’re wondering how to stencil on wood, this trick will save you from the frustration of paint bleeding under the stencils. 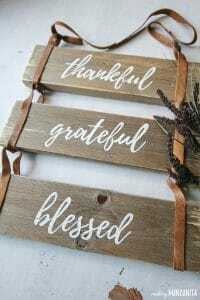 Do you have trouble with your stencils for wood bleeding when you are making DIY wood signs? You try your darnest to do multiple light coats of paint brushing away from the stencil edges, but there is still paint bleeding underneath your stencils, right?! It’s even worse when you are a using a rough, reclaimed wood – like pallet boards. Sign making was turning into frustration rather than a fun hobby…but then I heard about this game changin’ sign making hack. 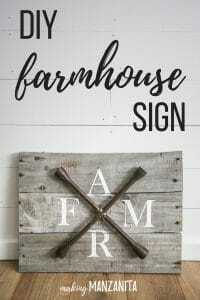 This hack on how to prevent stencil bleeding when you are making wood signs will seriously change the way you DIY signs. 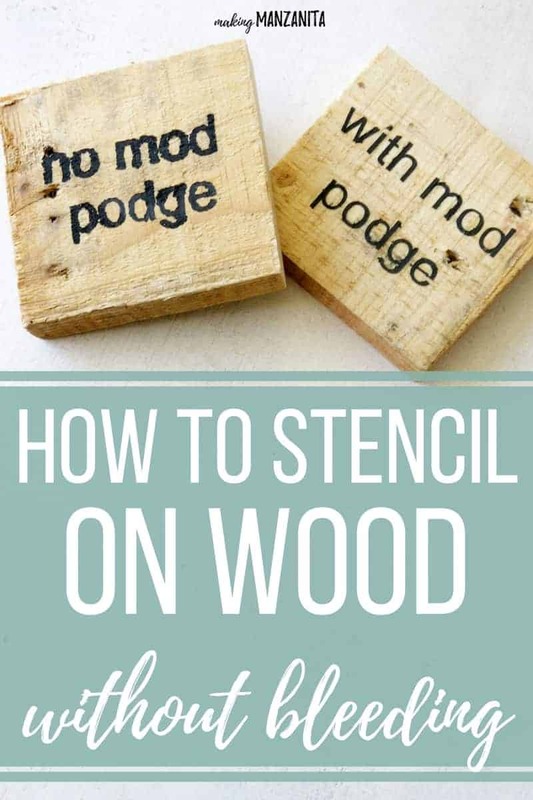 This how to stencil on wood post contains affiliate links, but nothing that I wouldn’t wholeheartedly recommend anyway! Read my full disclosure here. So…just so you can get the full effect of how amazing this sign making hack really is, here’s a look at how normal sign making goes. You cut the stencil out with your Cameo. I always use the adhesive shelf liner (aka contact paper) from the Dollar Tree. Then you put it on the wood….you push real hard to make sure it’s adhered and you go to town painting. You can try light coats. You can try letting the brush pounce on top of the stencil. You can try brushing away from the stencil edge. But I bet that you’ll still have bleeding under your stencils. Will you just look at how bad this one was!? This was on a piece unsanded scrap pallet wood. I used the exact same type of wood for the 2nd sign when I use the sign making hack. It’s just hideous. Keep in mind this is a tiny piece of wood and very small letters. Something’s gotta change though… this just ain’t working. I had to figure out how to prevent stencil bleeding. A few months ago during one of my Hometalk Live Videos, I was making this reclaimed wood sign. 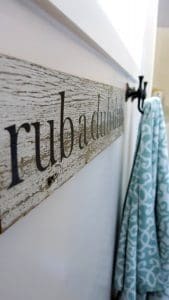 I was sharing my typical sign making tips to prevent bleeding…like using a foam brush and doing light coats of paint..always brushing away from the edge of the stencil, rather than towards it….and if all else fails, give it a light sanding after you’re done and call it “rustic”. That’s when one of the Hometalk viewers mentioned how she uses Mod Podge to seal her stencils before painting. I saw the comment later that night when I was scrolling through the thousands of comments and answering questions. I was intrigued. How have I never heard of this? So I followed up with her to make sure I understood it right…and then I gave it a try. It was when I was making these reclaimed wood bottle openers that I first tried this method. I was shocked. Like literally…jaw to the floor flabbergasted. Since I know you ain’t got time to scroll through all of the many comments in my Hometalk videos…I decided to dedicate an entire post just to this sign making hack. This is just too good not to share. Everyone needs to know how to prevent stencil bleeding. Because if you know how to prevent bleeding on your wood sign stencils, you’ll probably DIY more wood signs. And we all know the world needs more wood signs. Ready for this sign making hack? Be sure to subscribe to my YouTube channel for more DIY videos. Using a Silhouette Cameo cutter (or another type of paper cutter), cut out your stencil. I always use adhesive shelf liner from the Dollar Tree to create my stencils for wood. It works great and it’s so cheap! Step 2. Peel & attach stencil. After it is cut, peel off your stencil and press onto the wood. Press hard to make sure it sticks. Now…this, my friends, is where the magic happens. Take your Mod Podge and just rub is over the stencil in a light coat. I just use my finger for this, but you can use a foam brush if you’d like. This seals the edges of the stencil so that the paint won’t bleed under it. 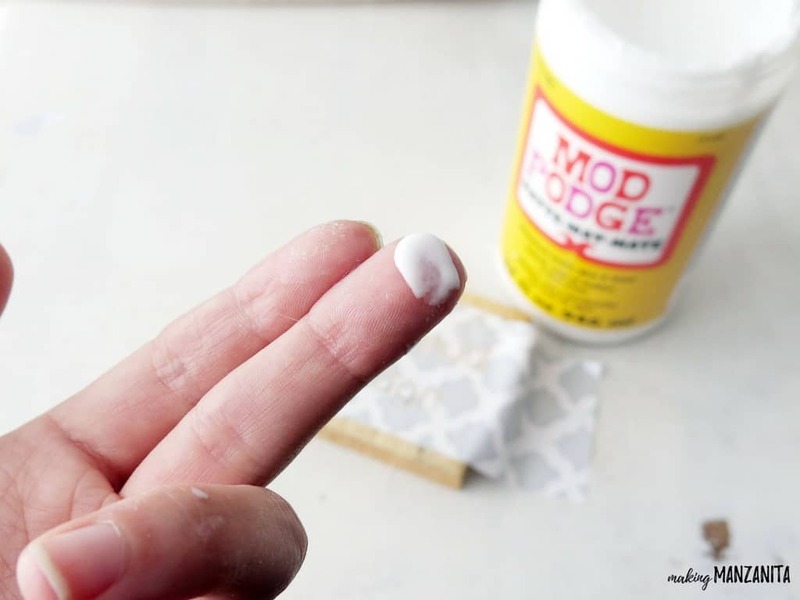 You only need to do one coat of the Mod Podge. Wait for it to dry completely before moving on to the next step (15 minutes or so). Step 4. Paint over stencil. Next you just paint over the sealed stencil. I typically use acrylic craft paint and do 2-3 of lights coats of paint. Step 5. Peel off stencil and be amazed at the crisp lines. After your paint is dry to the touch, you can remove the stencil by peeling at one of the edges. Will you just look at those crisp lines?! Are you as shocked as I am? See…I told ya so! Making professional looking wood signs doesn’t have to be frustrating! You can get crisp stencil lines using this easy sign making hack with Mod Podge. 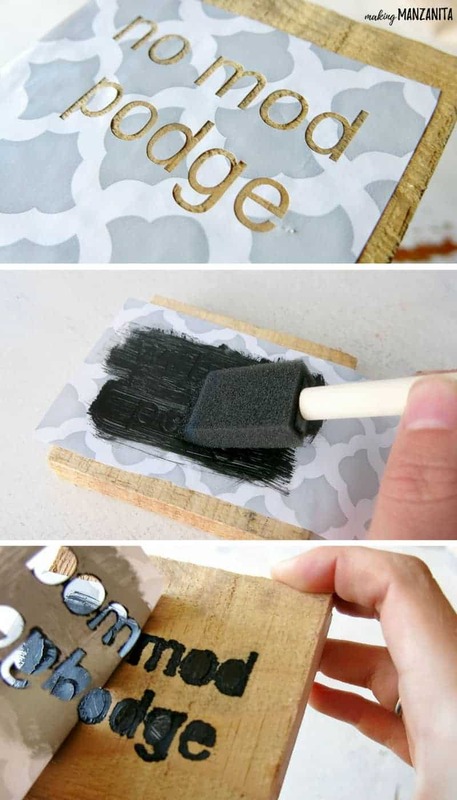 All you have to do is put a thin layer of Mod Podge over your stencils for wood before you paint! This hack on how to prevent stencil bleeding when you are making wood signs is going to change the way you make signs, am I right? This whole sign making hack is shown way better in a video format, so don’t forget to watch this short video to see how it’s done! If you love videos, check out my video page for more. Fantastic!!! And hurray for the dollar tree! Love that store. Ruth, I’m sooooo glad that you found this hack helpful! Thank you so much! I’ve been procrastinating my stencil art jobs for weeks now trying to come up with a better way to make them look nice. Now I can run out to the dollar store and buy that one prod. Modge Podge. Yay! So glad you’ll start stenciling again. Have fun! Wow! This is impressive!! Sharing on FB. :) i will be trying this for sure! 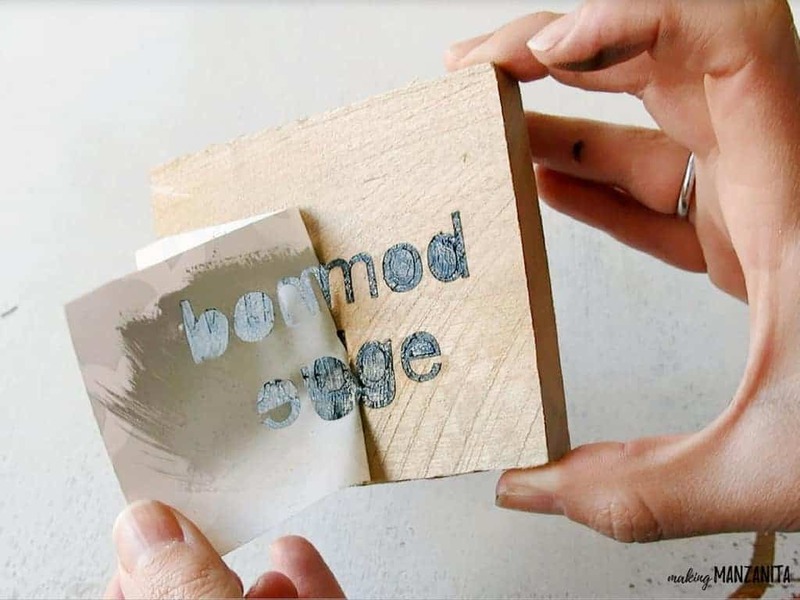 Do you rub the mod podge over the edges of the stencil onto the wood or just up to the edge of the stencil? Rub it all over the opening of the stencil…most specifically getting the inside edge where the stencil meets the wood. That’s the part that you want to get sealed. …getting ready to do a table top with a stencil and was wondering, although the top isn’t rough like pallet wood and I normally wouldn’t do a clear coat on that; however, I want to do one on my table top after stencil……any hints, my first time? I like the mod pod idea, def doing that but I am wondering if a clear coat (poly) would smear the paint w/ mod pod? Advice needed…..
For a tabletop, I would recommend using Mod Podge to seal your stencil down before you paint it. Be sure to use the Matte finish, not the glossy. Then after you’re done with the stencil, I would recommend sealing with a Polycrylic. It shouldn’t yellow like the Poly may. I use pallet wood for a lot of my projects and i usually stain the wood then follow up with a clear coat. I wouldn’t want to stain over the stencil, would you suggest stenciling in between the stain and the clearcoat? Or stenciling after both applications? Both are oil based. 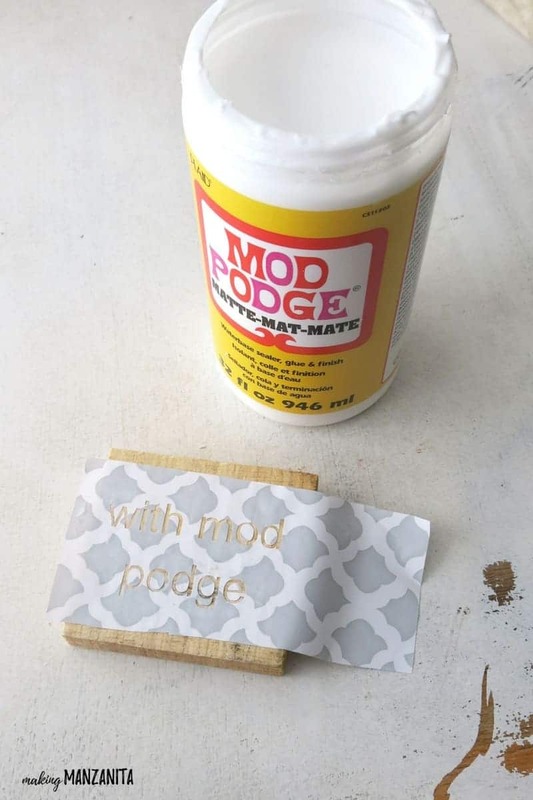 I would definitely try this on a piece of scrap wood first, but I will say that I’ve tried the Mod Podge hack over a piece of stained wood before (not sealed) and it worked fine, so you would be good to stain, stencil and then seal. No, I never wait 24 hours for the Mod Podge to dry for this hack. Works when it is just dry to the touch (when stenciling on wood). Usually takes about 15-30 minutes. Good luck! What if you used your hair dryer to dry quicker? Yes you totally could, it just needs to be dry to the touch. No I never wait 24 hours! I usually just wait until it is dry to the touch for this. I’ve never used on spray painted wood. Probably depends on what color and type the paint is and how noticeable the mod podge would be. I do always use matte finish mod podge so it’s not glossy shine! Was so excited for this trick! But I just did it and when I peeled my vinyl stencils off a lot of the letters peeled off with it 🙁 I am wondering though if it was because I sealed the stain before painting my letters on. I did that hoping it would avoid the beeding. Then I used your trick on top of it. Have you had this happen before? Ugh, how frustrating! I’ve never had this happen. I wouldn’t think the sealed stain would make a difference but possibly it did because the mod podge & paint weren’t able to be absorbed at all into the wood? I also always use contact paper to make my stencils, not vinyl because it’s a lot cheaper. That may have something to do with it too! Let me know if you try it again! I’m curious! I’ve had this happen to me multiple times. I make signs a lot and I use this trick every time! I’ve learned that if you use a thick layer of mod podge it will attach to the vinyl and peel back off like elmers glue, taking your paint with it, but if you have a very light layer and try not to coat the entire stencil in mod podge (only where it’s needed) that it peels a lot better! I’m definitely going to try to contact paper though, I’ve been ordering stencil vinyl for my cutter and it’s definitely not very cost effective! Ya! I definitely try to keep it light. That’s why I use my fingers to apply the Mod Podge, I can control it a bit better than a brush. Also the contact paper is thinner than the stencil vinyl so you may have better luck with it because there’s not as much force when you peel the stencil off. I also don’t wait too long to pull the stencil off. Usually just until it’s just dry to the touch. For the smaller parts of the letters (like the middle of an “O”), I wait until it’s more dry. I have just started stenciling. I’ve spent double the time because the letters need all cleaned up afterwards. Searched for a way to alleviate so much time n I believe this may work, although I’m a little questionable as to the vinyl stencil. Will that glue attach to my stencil? Ruth, hopefully this hack makes your sign making easier! I don’t use vinyl for my stencils. I use cheap contact paper/adhesive shelf liner from Dollar Tree. I haven’t ever had troubles with Mod Podge sticking to the stencil. Good luck!! I also tried this after seeing another video about it and I agree with someone above who said some of the painted letters peeled off. I use dollar tree peel and stick as my stencil, matte mod pod, stained piece of plywood and acrylic craft paint from Walmart. It completely ruined one of my projects and I was so frustrated. Now cut the stencil with the cricut, place transfer tape over it, peel it off the cricut mat, remove the paper backing and brush mod pod on. Then I weed the letters out and stick the stencil on the wood. It works great EXCEPT I end up with dried mod pod on the wood around the letters. Is there a trick to removing it? Sorry you’re having troubles. Sounds like you’re doing things a little differently than I. I usually put the stencil on the wood, then out on Mod Podge over the top of stencil where the letters are. I’ve never put the Mod Podge under the stencil like you mentioned. Maybe that’s the difference ? I can’t think of anything that would remove Mod Podge but not the paint too like solvent or Goof Off would do. It happens to me that after applying the polycrilic once the vinyl is on (to seal the edges) I paint it and then I end up pulling the vinyl and with that comes my paint too :(. If I did with mod Podge doesn’t it need me to sand it a little bit before I apply the paint??? I am so glad I found this hack. I love this idea!! i am learning to stencil and all my work just kept bleeding. I do have a couple of questions, the signs i have already done, how can i touch up the ones that have bleeded? I used white wash before i stenciled. And will the mod podge still work on white washed and painted signs? Terrisa, glad you found this helpful. The only way to clean up signs that you’ve already done is painting over the parts that bled with your background color (if you had a background color). 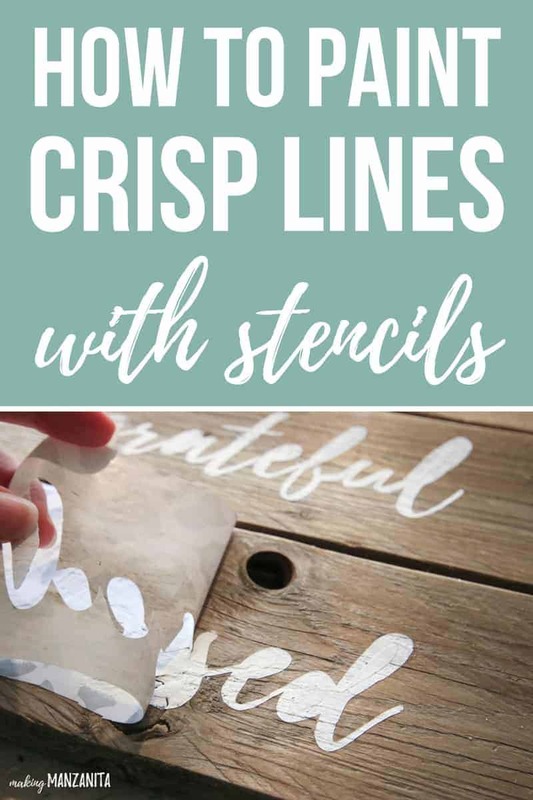 You could also try taking a paint pen in the same color that you stenciled and just cleaning up the lines by making it bigger in some areas. Depending on the design, this will sometimes work. The Mod Podge hack should work on painted signs as well (as long as they are wood). I haven’t had any luck with it on glass, metal, or other hard surfaces. 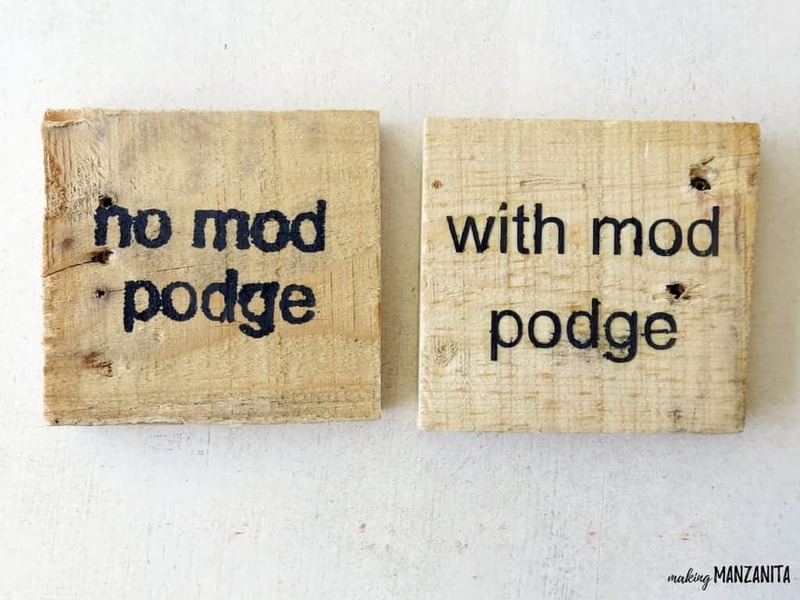 I think it has something to do with the fact that the Mod Podge can be absorbed into the wood a bit. Good luck girl! I am frustrated with my wood coasters few times and not successful as well. My first time to get try paint light green (chalk) and white (arycilc) Mandala Stencil paint with on my wood coasters. It won’t look great. Wonder, can you help me how to do protect from mess bleeding from color paint that which I kept tried and failed. I figured it out why? Help me and solve the problem. Thank you! Hi Joanne, so sorry you’re stuck on a DIY project! Your wood coasters sound so fun! 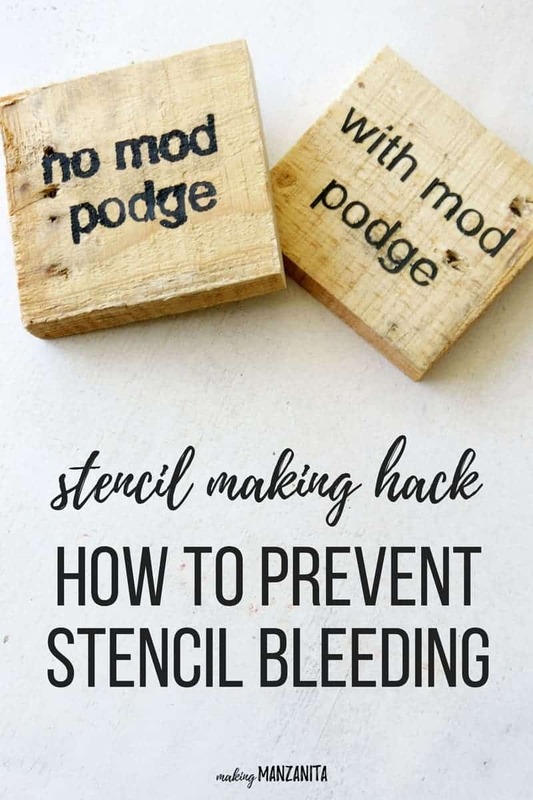 The Mod Podge trick I share in this tutorial should help prevent the bleeding. It also helps to do light coats with the paint and more so “blot” the paint brush up and down rather than a brushing motion over the stencil. These things will all help prevent bleeding under your stencils. I was wondering what your settings were for the contact paper? I’ve been having a heck of a time lately with mine….it randomly doesn’t cut certain letters, others are fine. I’m hoping if this paper is thinner it will be better than what I’ve been using! Do you think this would work while painting on glass? I tried this trick, but when I went to take my vinyl stencil off, it also took the words off too…. any ideas what I can do differently. So strange! I’ve never had that happen to me! Were you painting on wood? Or was it on a hard surface like glass or metal? If it was hard surface, that doesn’t work well because the Mod Podge doesn’t get absorbed like it does on wood. GAME CHANGER! I’m not actually a sign-maker, but I was looking for ways to stop paint bleed from under tape. I think this might just do the trick! Fingers crossed! That’s a great way to use this!! Please let me know how it goes! I was wondering how you get the middle of letters (i.e. o, e, d) to come up easily? When I try to pick them up with tweezers I ding the wood. Any advice? What about if I use paper stencils? I’m scared to do this without advice if anyone has done this before. I would not recommend this method with paper stencils. 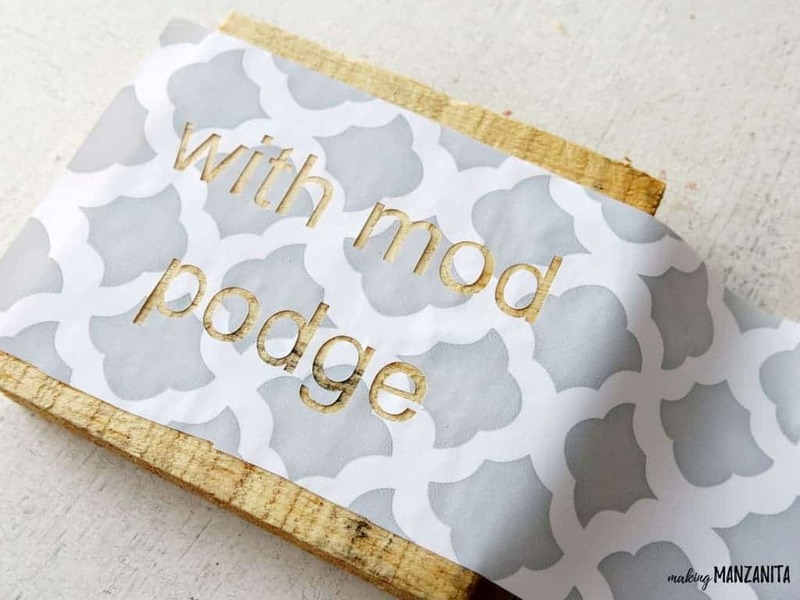 The Mod Podge will likely make the paper stick to your sign because it’s really a glue. Thank you, thank you, thank you!! 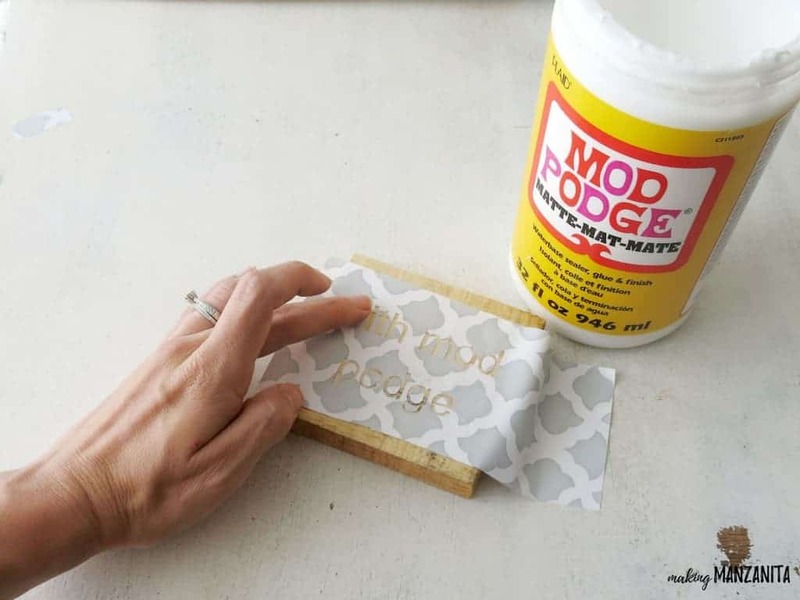 I kept reading about using Mod Podge to seal stencils, but I didn’t understand how to do it. I made a couple other signs on wood and it bled, and I didn’t want that to happen again. I am so thankful for your step by step instructions. My mom has a giant welcome sign with a pumpkin painted for the O, so I made her signs she can use for the other three seasons. They turned out great. So glad these steps were helpful for you! Your signs sound awesome. I’m confused as to how to get the spaces in the “O” “B”, etc. to be the color of the background and not the color of the used for the words? There were stickers for the middle of the letters, they just got painted over so it is hard to tell. Then once they are dry you can remove. I’ve never tried it but I dont see why not? Let me know if you do try it out. I’m also curious about using this with mylar stencils because that is what I have and want to apply it to some antique barnwood. I’m wondering if I should glue (Mod Podge) the whole stencil to the wood (since it isn’t contact paper) and then go over the top with more Mod Podge to seal the edges of the stencil. Also, does the paint that was applied over the Mod Podge peel off? How do you keep the paint from peeling? Thank you. What did you set you cameo on to cut out the contact paper? On my older model, I just used the vinyl setting and it was perfect. Since upgrading to the new Cameo with autoblade I haven’t found the perfect setting yet!! This is brilliant. Quick question I print my stencils onto card stock paper and hand cut each letter with an X-Acto knife set. It takes time but I don’t make enough signs to warrant buying a cutting machine. They are just for around our own house. My question – do you think this method would work well with the stock card paper? Hi Mark, No this wouldn’t work for cardstock paper because the Mod Podge would essentially glue the paper to the sign. You would need to use vinyl or contact paper or something of the like. You could still make this work by printing the designs on to contact paper though. You could probably just tape the contact paper to printer paper and run through the printer. I haven’t tried that but, it is worth a shot. I get my contact paper at the Dollar Tree, so it wouldn’t be a big investment if you wanted to try it. Yup figured that out last night on a test piece of wood. The Podge glued the paper right to the wood. Next I tried printing right onto some vinyl shelf liner I had but the ink from my inkjet printer didn’t absorb (it ribs off) so that didn’t work. Then I found some Avery sticker paper (Avery 53203) and that seems to work great! I can print onto the sticker paper, cut out the letters by hand and then peel, stick to wood, Podge edges, paint and peel off of the wood great! Be careful when you peel the back of the sticker off when you go to stick it to the wood. I ended up doing it in smaller sections. The edges are perfect! Thanks again for a great article and your quick reply! Happy signing! Awesome!! So glad you found a solution. Thanks for sharing! Anya, so sorry you’re having troubles!! This has always worked like a charm for me! 🙁 Let us know how the tip on painting with the same color as your base coat goes! I’ve tried that when painting walls to prevent bleeding under painter’s tape and it did work, but I’ve never tried it with stencils!! Ok, I have got to ask: My main purpose for my Cricut is making signs… for my home, for my friends, etc. I’ve tried that exact same shelf liner you are using in the tutorial, I’ve tried contact, paper, I’ve tried other brands thinking maybe I just got an old batch or something, and ALL of them leave a sticky residue all over my “negative” area which makes an awful mess. It looks bad if negative area is dark because you can see the sticky goo. It looks terrible if the negative area is white because it looks dirty. Then I can’t distress the sign without the dust sticking all over it and making it look even worse. It makes me so sad because I see this hack used so often, and with me being the super economical, crafty DIY girl that am, I want to find the least expensive option available, but it is NOT working for me. Am I doing something wrong? That is so weird I’ve never had that problem before. I’m sorry that’s so frustrating. Are you stenciling on wood? Are you leaving the contact paper on there for a long time or just while you’re painting over the stencil? stencil on top of the painted surface. So frustrating, I have ruined several signs and had to sand everything off and start over, in fact it just happened again today. I’ve tried everything I could to wash the residue off but nothing works. Any suggestions??? Could you use this hack on reusable stencils? I am having some problems with bleed through. I have vinyl stencils, you mention contact paper, but Im not a artist when it comes to cutting letters out. Is there a catch? All I want is a stencil that I can use over and over, this is very important to me. Will vinyl stencils work with the mod podge if they arent sticky licke contact paper? And how do you clean the stencils after using mod podoge? 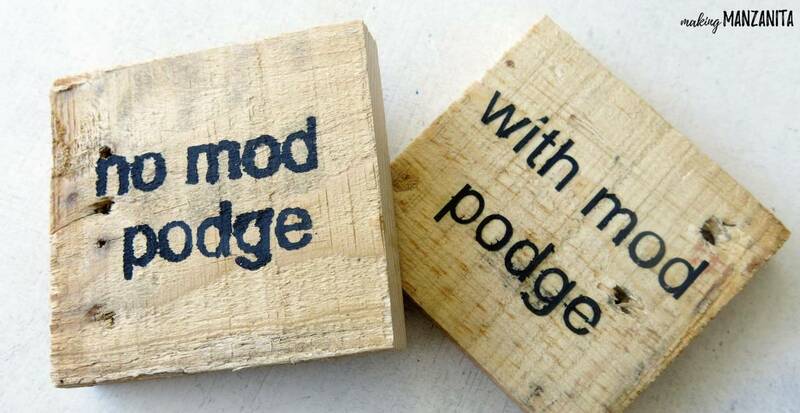 Oh and is it true Mod podge can be used as a finisher after your painting work is dry? Woohooo!! This is music to my ears. Thanks so much for sharing. I’m so glad this was helpful for you! How do I prevent my paint from peeling off of my wood sign. It peels of when I remove my vinyl . The paint comes if with the vinyl so annoying. HELP! Is the paint you’re referring to the part you are stenciling or any underneath layer. 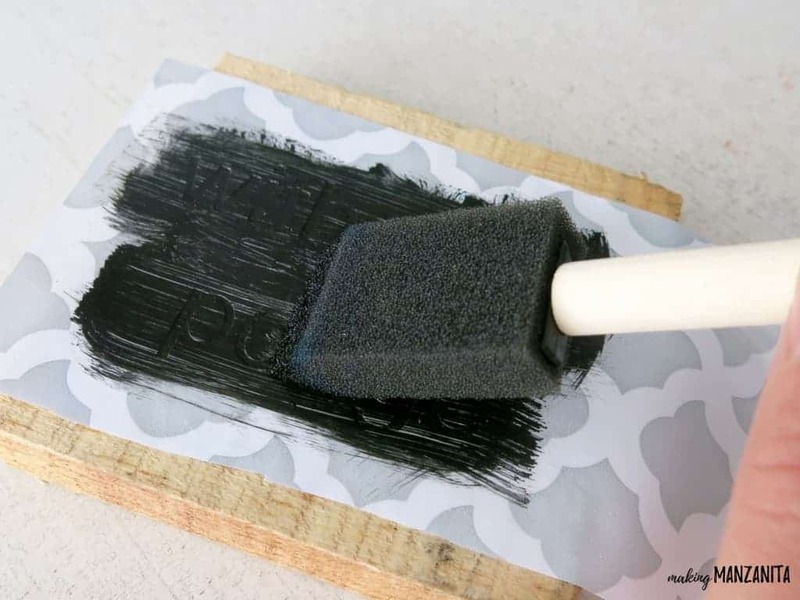 I always use contact paper from the Dollar Store for my stencils, no vinyl and I use cheap acrylic craft paint for the actual painting (in addition to using this method of applying the Mod Podge over the stencil prior to painting). With all of these steps combined, I don’t have much issue with the paint peeling. I also be sure the wood is nice and clean and at the very least lightly sanded before starting. If there is oil or residue, the paint may not adhere as well. Be sure to wipe all sanding dust off wood as well. Hopefully one of those tips will help prevent peeling from from your wood signs! Good luck. I received a ton of pallet wood for free. Even though I sanded it some it’s still pretty rough and I’ve been having so much trouble making good looking signs. I love this tip! Trying it right now. Fingers crossed! Awesome!! Hope this helps! I’ve made a ton of signs with pallets, so hopefully this does the trick for you too. Hi Jodi! I’ve never made stencils out of poster board, so I’m not sure how to answer your question. The contact paper is the only material I use.